Fascinating and so true on many many levels. Very cool…Thank you for the informative article and chart! I’m a home brewer of beer. I read quite a few blogs and such where others worry about chemicals (or worse….GMOoooooooooooos) in beer. Either they say, “I don’t put” or “I don’t want” “chemicals in my beer.” All the time forgetting the most dangerous chemical in the beer is the alcohol (ethanol). For a great visual on caffeine, I recommend CGP Grey’s YouTube video. It’s less than four minutes and it’s informative and entertaining. I forgot to mention…great post Doc! Very interesting. Of course, LD50 is only one way to measure toxicity, and it fails to account for a number of different ways that substances could have negative health effects, especially over the long-term. I didn’t bother to look up glyphosate, but somehow I doubt “RoundUp-deficiency” is a nutritional concern! First, copper sulfate and copper are not the same. Copper’s LD50 is 5,000 mg/kg, while copper sulfate’s LD50 is 300 mg/kg. Second, this post is but one look at toxicity, not a full dissertation on every aspect of toxicity, which would require a few semesters in college to go over. That doesn’t mean the information is irrelevant. The point is the claims that organic growing is somehow “toxicity free” or “chemical free” are disingenuous and inaccurate. Thanks, Chuck. I’m not sure why you assumed I didn’t know the difference between copper sulfate and copper. If you refer to the link I provided, you’ll see that the EPA references copper because it is the active component of concern in various copper-containing pesticides, including copper sulfate. Secondly, I never suggested that the information in this post was irrelevant – I simply pointed out that it was part of a larger picture, which, as you say, is very complex. Finally, my experience is that most reliable, reasoned descriptions of organic agriculture avoid implying that organic products are “free” of anything.I do not think it is fair to judge anything based on statements made by those at the extremes. There are other comments that say that organic farmers are required to monitor copper levels – pretty good sign it is toxic ………at the given dose. So it still makes the point that toxicity, dose and exposure are the relevant things. Also it is not illegal for a farmer to have copper higher than desired- if someone inspects him/her land (how often does that happen, they would lose their certified organic label – but they could still label as organic. Way too much copper and then the EPA gets involved- but again someone has to monitor and report and people don’t do that. These labels mean virtually nothing which is why the FDA only wants labels to mean something about safety. Thanks for the comments Tony. You make good points regarding toxicity. To address your other concerns, organic farmers are inspected at least once annually. Organic farmers are required to document pest control plans that avoid and minimize the need to use approved pesticides, including copper-based ones. Organic farmers who use copper-based products (even as soil amendments) are required to test their soils to ensure that copper is not accumulating to excessive levels: the goal is not to punish them once they exceed permitted levels, but to avoid the problem altogether. With a few exceptions, farmers are not permitted to call their products organic unless they are certified organic. “People” may not monitor or report, as you claim, but the monitoring and reporting requirements are very clear for organic farmers. Organic farmers are required to document other management strategies employed before resorting to an approved pesticide, and they are required to test to ensure that copper levels are not accumulating to excessive levels in the soil. Of course, if you have any citations to back your accusations, I’d welcome the opportunity to address them. Luca, thanks for posting your comment. As an organic producer, Rob is – of course – very knowledgeable. I defer to his expert opinion on this. Thank you, both, for engaging on this blog post. This is the big mistake people make – many vitamins are micronutrients in micro amounts but toxic in higher amounts. many like caffeine in coffee or tea but take a high enough dose and it kills you. The fact that glyphosate is less toxic than table salt and many other substance that many think are safe. Nothing is really safe its does that matters. In many trial of glyphosate that people have used against glyphosate they fail to notice the dosage effect. If a substance is toxic its toxicity /effect should go up with dose. So a study shows some toxicity at one low dose but none at higher or lower doses – that is a clear sign the “toxicity” is not likely real. There are are some substances that are endocrine disruptors and have been seen to have an effect at a lower dose and not higher (partly because all the test subject die at higher doses). So when the lack of dose response (toxicity not going up with dose) is noted by the ant-GM activists they declare then glyphosate is probably an endocrine disruptor – but there is no biological basis or actual data saying that it is. Activist also quote a study (often sponsored by them) that says glyphosate kills human cells in culture – but many things not really toxic to people can affects cells in culture – simple soap, sugar, stable salt will quickly kill human cells in culture but that doesn’t mean they are toxic enough to be a problem to humans. ( I have a PhD in biology and biochemistry) and I know there are toxicologist and people pretending to be toxicologists. The key to the ranking of toxicities is we need to focus on dose, toxicity and exposure not one. With the very refined biochemistry techniques we can pick up tiny amounts of chemicals in the environment and in our bodies. Picking them up is not a problem – their level relative to their toxicity is key. The dose makes the poison is very near the top of my list of scientific truisms I wish everyone would understand intuitively. That simple fact reduces a lot of unnecessary fear and would save people a ton of money from hucksters. It’s worth noting that the EPA rescinded the registration of rotenone as pesticide in 2006 for all uses except as piscicide (to control invasive fish, primarily by agencies like the USFS). For various reasons it remained available in over-the-counter pesticides until at least 2011. Perhaps it is still used agriculturally in other countries, but it can’t be legally used in the US in agriculture, organic or otherwise. Good to know! Thanks Mike! Wasn’t rotenone voluntarily withdrawn from the market in 2008/2009? Thanks for the comment and the link, Kevin. The LD50 that I have listed on the table is for oral doses in rats. Worth noting, according to your reference here, that it is the ACCUMULATION of NAPQI that results in a toxicity problem and “not acetaminophen itself nor any of the major metabolites.” NAPQI is the toxic by-product produced DURING metabolism of acetaminophen. Thanks again, Kevin. Appreciate your input on this. the LD50 for THC is 1250 mg/kg, that is a lot of weed. 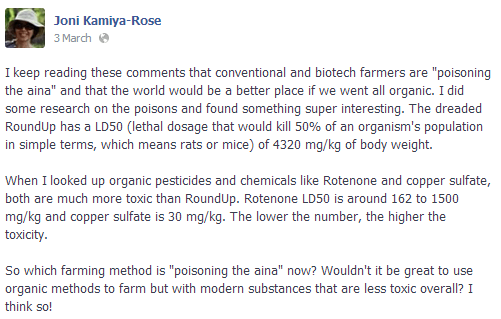 LD50 is a relatively narrow window on toxicity. It’s a measure, strictly, of acute toxicity — chronic exposures behave entirely differently. With this caveat, though, the only concern I have with the graphic is the last column, the “toxicity category” (and I understand it’s taken from an EPA source, ultmately). But just think about this: caffeine is listed as “very toxic” but I would have to consume 100 cups of coffee in relatively short order to consume enough caffeine that it would kill 50% of rats. Not 100% of rats. Not 90% of rats. 50%. That’s considered “very toxic”? That sounds more like fear-mongering to me. It makes one wonder if the only reason they’ve called it “very toxic” is because it allows them to avoid collapsing some of the others like glyphosate into the “practically non-toxic” category. I guess that we should have to call EPA’s attention to their categorizations, Dave. And this is caffeine. If coffee were included in the table in its diluted form, it would likely have a reduced toxicity ranking. Presumably.